William and Lydia’s fourth child was born in Bangalore on May 15, 1874. Her name was Florence Edith, and she died at the Wellington Military Hospital on September 27, 1876, when she was two years old. She was buried the next day, in the Wellington Cantonment Cemetery. I found this record on Barry Lewis’ site detailing cemeteries in South India. On her death record from LDS, her name is listed as Florence Ada. I don’t know the cause of her death. 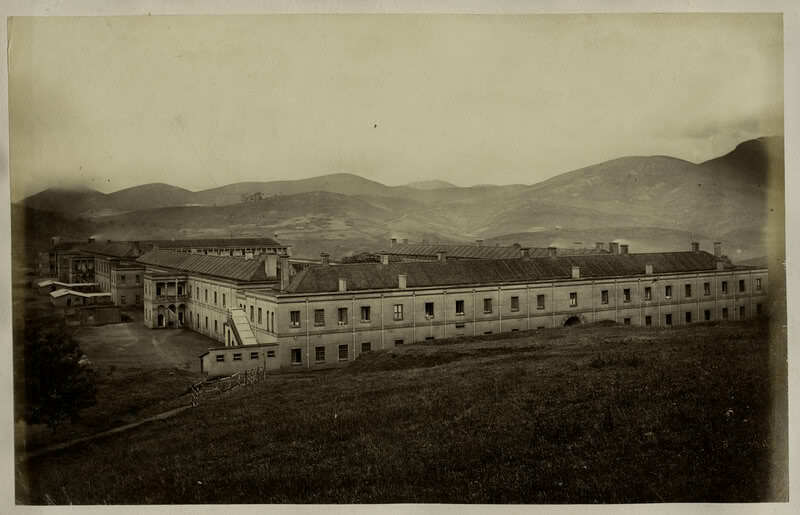 Wellington Military Hospital in the 1860s. Wellington Military hospital was within Wellington Barracks which had been completed as a hill station in 1860. A cantonment town grew up around the barracks taking the name Wellington. It is situated in the Niligris District of Tamil Nadu. The cantonment is still in use by the Indian Army as home to the Madras Regiment and it also houses the Indian Defence Services Staff College. The cantonment had its own cemetery. This child’s name has particular significance to me and my mom. Jane Hall Gray named one of her daughters Florence Edith. My grandmother Lydia Gray Porter named her second daughter Edith (my mom), but she was called Ada by her family. When my mom wan adult, she needed to get a birth certificate in order to get a passport to travel abroad. She found out her name was Florence Edith and that she had been born on September 15, 1919 and not on September 23 as she had always thought. Her solution was to make her name Edith F. Duffy and to keep September 23 as her birthday. Then when I was born in 1943, she game me her own name of Edith. She really thought she was going to have a boy and would name him after my father James Joseph. S-o-o-o-o-o, if everyone had known all the facts about family names, I could have been Florence Edith the Fourth! My great-grandmother, Jane Isabella Hall, was born in Port Blair on May 22, 1871. She was William and Lydia’s third child and first daughter. As you can see from the map below, Port Blair was on the Andaman Islands in the Bay of Bengal, over 700 miles from the Indian subcontinent. The Headquarters of the Penal Establishment at the North End of Ross Island, Andaman and Nicobar Islands. Source: Illustrated London News, Feb. 24, 1872. When the rebellion of 1857 provided the British with a lot of new prisoners, it made the new Andaman settlement and prison an urgent necessity. Construction began in November 1857 at the renovated Port Blair, avoiding the vicinity of a salt swamp which seemed to have been the source of many of the old colony’s problems. The penal colony was originally on Viper Island, named after Lieutenant Blair’s vessel, The Viper. The convicts, mostly political prisoners, suffered life imprisonment at hard labor under cruel and degrading conditions. Many were hanged, while others died of disease and starvation. Between 1864 and 1867 a penal establishment was also built with convict labor on the northern side of Ross Island. These structures are now in ruins. James Street, circa 1880, was an important shopping district in Secunderabad. William and Lydia’s second son James was born in Secunderabad on July 3, 1868. There is no mention in William’s military or medical records that William was ever stationed in Secunderabad, but James’ birth record on Family Search says he was born there. I’ll have to investigate this discrepancy further. It’s another puzzle. Secunderabad was founded as a British cantonment by the British East India Company in 1806. The twin cities of Secunderabad and Hyderabad are separated by a man-made lake. Unlike Hyderabad, the official language of Secunderabad was English. Secunderabad was exempted from customs duty on imported good thus making trade very profitable. Various new markets such as Regimental Bazaar and General Bazaar were created. 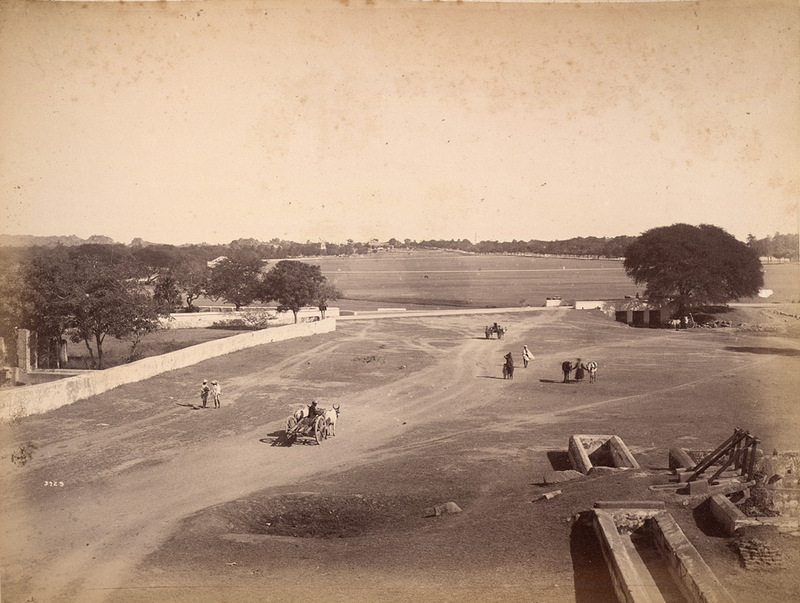 After the Sepoy Mutiny of 1857, the construction of a seven metre high wall was started at Trimulgherry and completed in 1867.Secunderabad Railway Station one of the largest in India which is also the zonal headquarters of South Central Railway was established in 1874. The King Edward Memorial Hospital, now known as Gandhi Hospital was established in 1851. A Civil Jail (now a heritage building known as Old Jail complex near Monda Market) was also established. Originally constructed in 1860 as the country house of the British Resident at Hyderabad, the Residency House is now known as the Rashtrapati Nilayam, the official retreat of the President of India. Sir Winston Churchill, the Prime Minister of the United Kingdom during World War II, was posted in Secunderabad during the 1880s as a subaltern in the British Army. Sir Ronald Ross conducted his initial research on the cause of malaria in the city of Secunderabad.The original building is today called the Sir Ronald Ross Institute and is located on Minister Road. Secunderabad Municipality was formed in 1945 and in 1950 this was upgraded to Secunderabad Corporation along with Hyderabad Corporation. In 1964 both these corporations were merged to form a single Municipal Corporation.Today Secunderabad is part of the Hyderabad district. Secunderabad celebrated two hundred years of its formation in 2006.Post-Independence, the Secunderabad Cantonment Board came under the jurisdiction of the Indian Armed forces. Consequently large military units were established.